Note from the League: As Director of the Bicycle Friendly America program, I get to work with local advocates and entrepreneurs all over the country who have a profound impact on their local community. I first met Christine in 2014, just after Tampa had received Honorable Mention in the Bicycle Friendly Community program. She noticed that Tampa’s BFC Report Card highlighted the fact that her city had zero Bicycle Friendly Businesses, a number she wanted to change. She founded Pedal Power Promoters, a social enterprise supporting local bicycle initiatives, and worked with the Tampa Downtown Partnership to help local businesses become bicycle-friendly through the BFB program. As a result of Christine’s work, Tampa has gone from having zero BFBs to 28 in just three years, a transformation that has been incredible to watch. The city is now ranked sixth in the nation for communities with the most Bicycle Friendly Businesses! Her work also helped move the needle to getting Tampa up from Honorable Mention to Bronze Bicycle Friendly Community status in 2016, and ranked among Bicycling magazine’s 50 Best Bike Cities for the first time. Now, Christine is partnering with a “dream team” in St. Petersburg, Florida, where she’s aiming to have a similar impact. Read on to learn how Christine and the St. Pete Dream Team are doing it. At the 2018 National Bike Summit, Christine was awarded the Susie Stephens Joyful Enthusiasm Award for the passion she brings to her work. In the wake of Hurricane Irma, the focus on greater sustainability and resiliency has never been more important in St. Petersburg, Florida. Fortunately, growing active transportation has been underway for years, and now the makings of an outstanding local Bicycle Friendly Business program are in place: vision, leadership, teamwork and business champions. On Bike to Work Day earlier this year, Mayor Rick Kriseman launched St. Pete’s local BFB effort as part of the Healthy St. Pete initiative. “Biking is good for workers, good for businesses, good for neighborhoods, good for sustainability and good for the City," he announced in May. Having support from the Mayor’s office obviously strengthens this effort, but what really makes this an exceptional program? First, the motivation: health and wellness are the driving force for St. Pete’s BFB plan, as part of the city’s Healthy St. Pete program. Secondly, the city assembled a dream team to design, implement, and oversee it. Not only is each member highly motivated and knowledgeable, they represent the ideal combination of key disciplines: economic development, marketing, parks and recreation, and of course, a rock star transportation expert, Lucas Cruse. For local St. Pete businesses, being bicycle-friendly is an obvious fit. “The chamber and our members exude the culture of community that attracts the talent that will be the future of our economy. That talent wants accessibility and bikeable, walkable livability,” says Chris Steinocher, President and CEO of the St. Petersburg Area Chamber of Commerce. Martha Boden, Chamber of Commerce Transportation Committee Chair, decided early on she wanted to be a champion for bicycling in St. Petersburg and to create the first “BFB block.” Boden is the CEO of SPCA Tampa Bay, a non-profit animal shelter and public veterinary hospital located outside of St. Pete’s urban core, in an area poised for a renaissance. She recognized the value of embracing active transportation to support the area’s redevelopment and began educating and cajoling her business neighbors to join SPCA in pursuit of BFB certification. She encouraged combining company employees at LCI-led Smart Cycling education sessions, and coordinated the flow of information between businesses. “I want all six businesses on my block to get certified together!” she says. Christine Acosta is founder of Pedal Power Promoters, LLC, which assists communities and companies with bicycle-friendly initiatives and provides Bicycle Friendly Business consulting. She is also the executive director of Walk Bike Tampa. 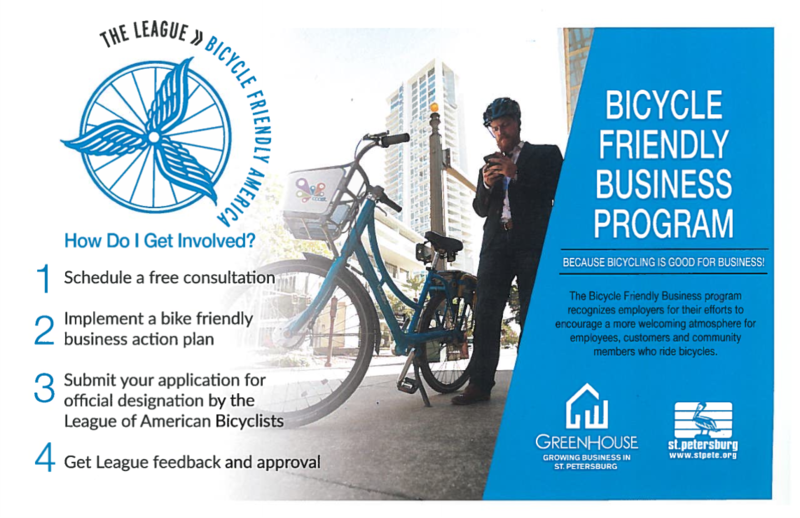 To apply for bicycle-friendly recognition for your business, or to learn more about the BFB program, visit bikeleague.org/business. I lived near St. Pete for 4 years, and transitioned to doing almost everything by bicycle. Pinellas County has a great network of bike trails and bike lanes. I miss it so much since I moved to Hawaii!